A roley-poley, heathy, breastfed baby! There is nothing in the world so pure as the bliss on the face of a baby at the breast, and what a joy when that relationship can continue during the toddler years! Now you can celebrate that joy with the wonderful line of infant and toddler clothing from Wavin' Baby Designs. Available in 6 different messages (shown below) and a variety of colours, these are sure to please every nursing duo! All designs are beautifully embroidered onto the clothing. I still take my milk fresh from the tap! Please take note that this is a new line for us and we do not currently keep it in stock. All orders will be shipped dirtectly from the designer in the United States. Any border fees (although they are unlikely) are at the expense of the customer. We hope to be stocking themas part of our regular line in the near future. All orders are custom orders and will ship within 3 weeks of purchase. Available in 4 spectacular colours (periwinkle, surf blue, buttercup, and azalea pink) and your choice of message, this t-shirt will quickly become a favourite in your infant's wardrobe! Periwinkle Surf Blue Buttercup Azalea Pink Style #1 Style #2 Style #3 Style #4 Style #5 Style #6 6 mos. 12 mos. 18 mos. 24 mos. 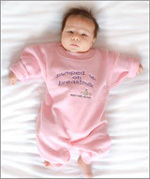 This one is sure to stay tucked and keep your baby's belly snug as a bug. With snaps at the crotch, this shirt isn't creeping anywhere! Available in 4 spectacular colours (periwinkle, surf blue, buttercup, and azalea pink) and your choice of message. "Making the decision to have a child - it's momentous. It is to decide forever to have your heart go walking around on the outside of your body." Perfect for spring and summer fun! Roomy t-shirt style with 3 snap closure on the shorts.Available in 4 spectacular colours (periwinkle, surf blue, buttercup, and azalea pink) and your choice of message. So warm and snuggly, you'll want to cuddle your little snuggabug all day. Comforting sweatshirt material will keep your little one comfy and warm all winter long. Ribbed crew neck and cuffs with a 7 snap crotch. 4 cozy colours to choose from (pink, ash grey, light blue and buttercup). 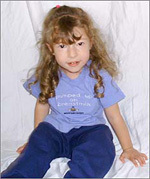 "My first vivid memory iis...when first I looked into her face and she looked into mine. That I do remember, and that exchanging looks I have carried with me all of my life. We recognized each other. I was her child and she was my mother." Yes, toddlers do nurse, and isn't it wonderful?! Let your little one show how much he still loves mama milk.Available in 4 spectacular colours (periwinkle, surf blue, buttercup, and azalea pink) and your choice of message. The average world wide age of weaning is 4.2 years. Your little breastfed beauty will be the cutie of the playgroups in this scrumptious dress. Short sleeves and a sweetly gathered waist. Available in 3 spectacular colours (lavendar, limeade and azalea pink) and your choice of message. Did you know? 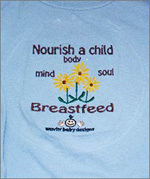 We also carry lovely embroidered t-shirts for Mamas who want to let the world know just how wonderful breastfeeding is!
" Nourish a child. Mind. Body. Soul. Breastfeed"
Made from 55% hemp and 45% green cotton, these suits just get softer and softer with every wash. Natural clothes for your natural baby! Hemp is the sturdiest, most durable, soft natural fiber. It is warmer and more absorbant than cotton, and has at least three times the tensile strength. What does this mean for your baby? Longer lasting, more comfortable clothes! Made from 55% hemp and 45% green cotton, these t-shirts are an economical and eco-conscious choice for your little one's layette.The softness of hemp is perfect to protect your baby's tender skin. Soft and protective hats to keep the elements at bay. Made from 55% hemp and 45% green cotton they are the natural choice for your baby, not to mention how adorable they are! Dark green background with gold glittery stars are sure to add pizazz to your wee one's dinner time! The perfect bib for at home meals or fine dining! WAHM made.